History of the Bowie Volunteer Fire Department and Rescue Squad, Inc. The Bowie Volunteer Fire Department and Rescue Squad, Inc. has a long and storied history. We are always attempting to locate past members of the Department to provide historical information and memorabilia for collection and display. Please contact the Webmaster if you have anything you'd like to share. In the mid 1800’s, Bowie was a much different place. Unlike the present day city with a population of over 50,000, Bowie (known at that time as Huntington City) was a very small rural community. With a population close to 500, it was a railroad town comprised of several general stores, blacksmith shops, livery stables, hotels and saloons. The Pennsylvania Railroad became a shopping area and shipping center for the local farm community. Shipping of tobacco, sweet potatoes, peanuts, peaches and other agriculture products to Baltimore and other markets became a thriving business. Suddenly, in the fall of 1910, a devastating fire struck the town and destroyed the entire business district. Losses included eight hotels and stores, the Pennsylvania Railroad switch tower, station, freight terminal and Superintendent’s home and office. One newspaper article estimated the damages at $50,000. The fire doomed Bowie's future for many years. Some of the businesses rebuilt, but many never recovered and interest in the community waned. After several years, efforts at re-development started to slowly move again in the community. The railroad rebuilt the station and other buildings and new general stores were built. A new elementary school was built at 8th Street and Chestnut Avenue. At one time shortly after World War I, efforts were made to organize a "bucket brigade" and had minor success in acquiring volunteer manpower and some equipment to use in combating fires. The equipment such as wooden and canvas buckets, ladders, and ropes were stored at the time in Ruptkys Blacksmith Shop. This early effort never got as far as formal organization and there are no official records of its existence. The existence of the "Bowie Bucket Brigade" is based on stories passed down by former residents of the area. With the beginning of the local newspaper, the Bowie Register, in April of 1927, the Bowie Volunteer Fire Department’s organizational efforts began to bear fruit. The need for a local fire department was demonstrated on June 10, 1927, when a fire destroyed the Bowie Racetrack grandstand, clubhouse and office buildings. The fire burned out of control since the nearest fire departments at the time were in Laurel and Bladensburg, over 10 miles away. Shortly after the racetrack fire, talk began in earnest in the community to form some type of mutual fire protection society. The owners and publishers of the newspaper began the development of community interest in the formation of a volunteer fire department. Following a series of articles in the Bowie Register, a meeting was held at the Bowie School on the evening of January 24, 1928. Mr. William Everett called the meeting to order. He introduced the local Forest Warden, Mr. Knauer, to speak on the need for a local fire department. Other speakers at the first meeting were Mr. C. L. Hughes, a trustee of the Branchville Fire Department, who spoke about his department’s fire equipment and financing and Mr. J. E. Burroughs, a Bowie resident, who spoke about the fire department at North Beach, where he kept his summer home. At the first meeting, Mr. Noah Joffe was elected the first Chief of the Department. William Everett was elected Assistant Chief and Mr. Bernard Luers was elected Secretary-Treasurer. The first fire call for the new Bowie Volunteer Fire Department occurred at 10:30 a.m. on Thursday, February 16, 1928. A chimney fire at the residence of Joseph Kline, Sr. was extinguished with chemical and salt. At the second meeting of the department Mr. W.L. Trott, Sr., was asked to serve as President and the department was on its way. Membership started to develop, a constitution and by-laws were developed and talks were under way for means of acquiring fire equipment and a station. It was determined at the first meetings that the department would not be connected with the town government or any other government agency. It was also determined that no tax monies would be solicited or used, but rather funds would be raised through volunteer contributions and fund raising events like dinners, plays, carnivals and other community functions. In just over two months the department acquired its first equipment. With a personal loan from Chief Joffe and through his business dealings with the Cherrydale, Virginia Volunteer Fire Department, two Ford Model "T" -chemical fire trucks were purchased for the total of $625.00. This equipment was placed in service immediately and housed in Mr. Kreitzer's Bowie Motor Company auto repair garage on 9th Street. Mr. Kreitzer furnished building keys to the officers of the department in order to have easy access when a fire call came in. With the purchase of the two trucks, a permanent fire station became the most important issue facing the company. In October 1928, a search committee was formed to acquire land for a building. Within a month arrangements were made with Mr. George Luers for the free use of some land on Chapel Avenue for the construction of a building. The conditions of the land use contained a clause that if and when the fire department ceased to use the property, it would automatically revert to Mr. Luers. Within the month, on November 12, 1928 the low bid of $415.00 for building the firehouse was accepted from Mr. Charles Fladung, a charter member. Construction was immediately started. An amendment to the construction contract was made the next day to provide a side door for personnel to enter. The additional cost for this item was $8.00. Painting and electrical work were not included in the contract and this was provided on a voluntary basis by the members. A pot-bellied stove donated by Mr. Jacob Berlin provided heating. The new building was finished and dedicated on December 17, 1928. Mr. Nova, owner of Nova's Store, donated the department’s first membership badges. Chief Joffe loaned money and made numerous contributions along with the Bowie Motor Company. On September 12, 1928, the department became a member of the Prince George's County Firemen's Association and was assigned Engine Company 19. The books were closed in 1928 debt free. The new station and two fire trucks were paid for. During the first year, several fires occurred. A house fire on Duckettsville Road across from the Lutheran Church was totally destroyed by fire. The loss was mainly due to the limited capacity of the soda-acid tanks on the two fire trucks. This fire brought about action to acquire additional fire equipment that would have a large capacity for carrying water as well as pumping. A First Aid Unit was formed within the department and headed by Captain Truitt McClelland along with 20 men. It was during a visit by Chief Leonard of Hyattsville and also chief of the County Rescue Squad accompanied by William C. Tierney of the Greater Capitol Heights Fire Department and Chief William Smith of Boulevard Heights Fire Department that interest in first aid and rescue work developed. During 1929 and early 1930 plans were made to purchase a new fire truck. In mid-1930, a new Ford fire truck with a 250-gallon water tank and 350 gallon per minute (G.P.M.) midship pump was delivered and placed in service. The Meeks Body Company of Washington D.C. mounted the equipment on the Ford chassis for a total cost of $1,650.00, the largest single amount spent to that date. Funds to pay for the new truck and for operating the department continued to be raised by holding dances, bingos, dinners and fund drives. The County Firemen's Association also started a $275.00 annual payment to the department. Movies were shown at the Bowie School to raise funds. The profits were split between the company and the exhibitor and the department raised at least $10.00 per week. Moving forward through the 1930's the department progressed and grew at a rapid rate. In 1931 officers were changed for the first time. Joseph Kline, Jr. was elected Chief and held the position for 16 years, until 1947. Plans were also made for the expansion of the department with a new firehouse. Bowie hosted the 10th Annual County Convention in 1932. Noah Joffe was elected President of the County Association. The convention that year was the largest affair to ever take place in Bowie. In 1933 work continued for acquiring a site and developed plans for a new firehouse and fire truck. The two Ford Model "T's" were in need of replacement. Plans were finalized in 1934 an order placed for a new fire truck from American LaFrance Company at a cost of $3,275.00. The equipment was mounted on a Ford chassis acquired through the Bowie Motor Company. The delivery of this new fire truck in 1935 was another first for Bowie- it was equipped with a windshield to protect the driver and the officer. The new truck also created a serious storage problem because the existing station was no longer able to house all the equipment. As a partial and temporary solution, the department rented the horse stable and barn, located adjacent to the fire house, from Luers Brothers Grocery Store, to house the two Ford Model “T” trucks. In 1936, after much discussion, site searching and deliberating, Mr. Isaac Kimmel sold his vegetable garden plot on 9th Street, adjoining his store to the Fire Department for $700.00. Again progress and plans were under way to get financing for the construction of a new building. It was through the efforts of the officers and men of the department, the Town Commissioners of Bowie and the Bowie Improvement Association that plans went forward to get partial federal funding for the construction of a combination Fire House and Town Hall. As a result PWA Project Number MD 1152F was established during 1938. Matching local funds were acquired from the Bowie Improvement Association and a loan from the Bank of Bowie. Specifications were developed and drawn at no cost by Mr. Spencer W. Phelps, a Bowie resident. After many changes in basic design to comply with money limitations, a contract was signed for $6,000.00 with the A.D. Riden Company of Patuxent and construction started in December 1938. The building was completed and dedicated on May 14, 1939. With the war clouds in 1937-40, early moves were established for Civilian Defense programs. The department acquired its first ambulance in 1938 and active participation in the County Rescue Squad Association commenced immediately. The first ambulance was a used 1936 Ford delivery van purchased and donated to the department by ten of the members. These men each paid $2.00 per month for two years to pay the note on the vehicle held by Baldwin's Dodge-Plymouth Agency at Collington. The van was converted to an ambulance by the members outfitting it with the necessary equipment to meet county standards and placed in service. For a short time the Rescue Squad operated without any specifically designated officers. In 1940 the squad incorporated separate from the department and elected officers. After several years the two organizations were joined together. As time moved towards World War II, the volunteers prepared themselves by providing training in first aid, fire fighting, rescue work, communications, aircraft identification, gas detection and fire equipment operations. Watch programs and nighttime standby crews were initiated during this time period. Another emergency measure started during the war was training several women as fire truck drivers. They were: Mrs. Hazel Howard, Mrs. Inez Randolph, Mrs. Beatrice Wildman and Mrs. Ruth Schaefer Lehman. During the war rationing became a way of life. Replacement for the most minor equipment needs was extremely difficult or impossible to acquire. Gasoline was rationed and the Chief was responsible for the ”Stamps“ and authorization to purchase fuel. A Junior Fire Department was formed under the leadership of the Chief, Assistant Chief, Captain and Lieutenant. Qualifications for membership included parental permission, at least 14 years of age, adhere to a strict code of discipline and ethics, remain in school as a student, participate and complete training courses and attend drills. After the war, plans were made to replace the fire trucks. The first 500 G.P.M. pumper was purchased and delivered. The pumper, an Oren-Brockway was dedicated in memory of Noah Joffe. In 1947 Chief Kline was elevated to President and Bill Wildman was elected Chief. The squad went through several used ambulances before its first new ambulance, a 1952 Pontiac, was purchased. Mr. Jim Wildman was elected Chief in 1953. During this time period Bowie experienced rapid growth. On February 18, 1959, Town Commissioners signed the annexation papers bringing the former Belair Estate into the Town of Bowie. With the development of Belair by the Levitt Corporation, the need for additional fire protection was pressing the department. Eventually, with no cost, but many strings attached, the land for Company 39 was obtained. The membership rolls grew at a rapid pace as new families moved to Bowie. Plans for the second station were finalized after more than two years of problems attendant to land, plans and financing. Two new Brockway-Seagrave 750 G.P.M. 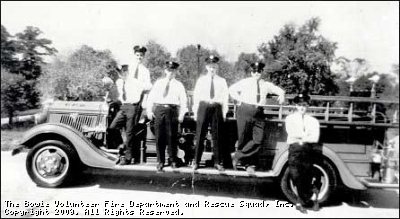 pumpers were ordered and delivered in 1964 to help outfit the new station. The station was occupied in late 1964, with a hose across the parking lot to supply water, and was dedicated in September 1965. Mr. Paul Moore was elected Chief in 1964. In June 1965 he resigned to be come one of Bowie's first paid firemen. Mr. Lawrence Woods was elected to fill his slot. In 1966, the City of Bowie, on request of the department, made a direct grant to assist with the salaries of the paid firefighters. Bowie continued to grow, from a population of 1,000 in 1960 to over 35,000 in 1968. Once the Belair station had been dedicated plans were underway for the construction of a third station (Company 43) to meet the needs of a developing Pointer Ridge section. Having gained experience in land acquisition, building design, financing and contracting during the construction of Company 39, plans for Company 43 were easier but not without problems. Final construction was completed and the station was dedicated in April 1970. Ramon J. Granados was elected as the eighth Chief in 1970. With three fire stations in operation, continued growth required preliminary plans for a fourth station in the Northview section, between Companies 39 and 43. A fifth station was projected for the industrial center in an area south of Company 43. The slowing of development in the 1970’s and 80’s delayed those plans. From early 1967 discussions developed concerning either extensive remodeling or redesigning or complete replacement of Company 19. After evaluation of the building and limited ground space, it was determined to construct a new building. A site selection task force was established and after several meetings a tract of land was purchased on Chestnut Avenue running from 12th Street to 13th Street. Neighborhood protest leading to the County courts resulted in a decision that the company could not build on the site. In 1974 Mr. Martin Shultz was elected Chief. After several years of delay, Prince George’s County replaced Company 19 in July of 1975. Prince George’s County’s fourth Advanced Life Support Unit was stationed at Company 43 in May 1981. Company 39 had an addition constructed in 1987 at a cost of over $500,000.00 The station was remodeled to include three drive through bays, new offices, bunk rooms, storage areas, kitchen and recreation areas. This site has been viewed 929,688 times.